Motorcycles have a certain thrill to them it gives you the thrill of having wind currents blow in your face. However, they have a significant drawback, they can tend to be very noisy, and that will quickly kill the thrill of using them unless you go for a quiet helmet. how do you know the best helmet to pick? How would you even know the criteria behind their choice? If you are asking these questions, then do not worry I have done the legwork for you, in addition to picking the best five quiet helmets that not only will help you ride silently but will save you some money. When choosing a quiet helmet, there are many variables that can affect the levels of noise you get in the helmet, so you cannot say one is ‘the quietest’. These include the weather, and the motorcycle itself. For this reason, it is important to go in person and measure the helmet as well as the head size, so that you are sure it fits your head correctly especially for the neck. In addition, you should get quality earplugs as well, as you never know when you will need them. Lightweight helmets are much easier to use in the long term. This will also be determined by the fitting of the helmet itself, and this will distribute its weight easily around your shoulders and head. If the fit is wrong, it will still feel heavier regardless of whether it is lightweight or not. First of all, the helmet should not be too loose. Over time, the padding will compress and become loose, so you need to fit tightly. However, the helmet should not be too tight either, as you do not want to get headaches or pain when you are using it. The aim is to get one that fits snugly on your head, and comfortable cushioning between the external body and your head. The cheek gaps need to touch the cheeks, but it should not feel uncomfortable. In addition, the area between the brow pads and your temples should not have gaps (otherwise, the airflow will make it noisy, and it will be uncomfortable). The most important aspect is safety and comfort. This will go a long way in determining the levels of comfort you get. When a helmet has good air circulation, your head will remain cool, and you will stay fresh even on a hot day. Make sure to examine the outlet and inlet vents at its back, top, and the side that you can open easily even when you wear gloves. It is also a good idea to get a helmet that has chin vents so that the visor does not mist up. The ventilation must allow direct pathways for the air to flow to your head, while still retaining the ability to shut off airflow at certain times. There are three varieties you can choose from the front flip, full face, and open face. 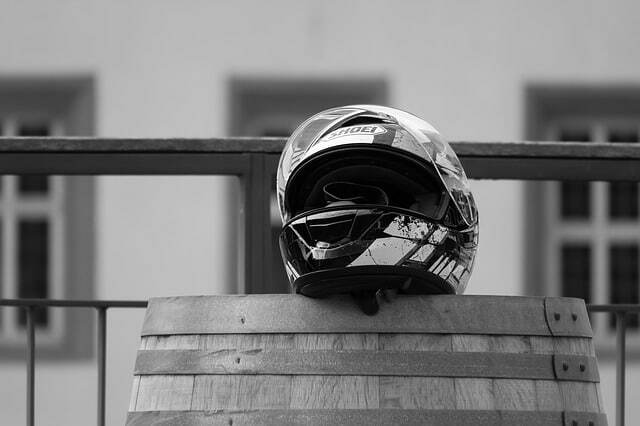 If you are looking for protection, then a full face helmet is the best choice, and it’s the most popular type. The visor is also movable and protects the eyes. The noise levels are also the lowest in this type, although you need to ensure the ventilation is very good as they can become hot. The open face helmet does not have the chin and face protection that a full face helmet does, so it is a good choice if you find a full face type claustrophobic or too hot. However, you do need to ensure they always have a Snap-On visor as well as googles, so that you can protect our eyes. It does have fewer blind spots, and they give you sufficient levels of freedom. On the other hand, a flip front helmet has become very popular, but you can use it as both a full face and open face helmet. The lid will give you proper protection as well as security, and it is versatile enough to fit into various situations. If you are searching for helmets at an affordable cost and gives you amazing features, then this is a great place to start the design is actually futuristic and interesting to look at. The high-quality build also ensures it is as long-lasting as possible, and you can also wear it comfortably if you wear glasses. The shell itself is durable and aerodynamic UV-resistant ABS, so you do not need to worry about any parts prone to breaking. It can also handle inner airflow pressure very well, making it one of the top quiet ones on this list. What confirms its high standards are the exceeding of DOT FMVSS 218 standards, and the design will also allow for use in multiple situations. The liner is also removable when you want to wash it, and this will help keep it free of odors, fresh and clean. However, it is disappointing to see there are no Bluetooth speakers provided, even though the helmet has extra space for them. This is the best pick in terms of durability, as it is made of a polycarbonate shell of premium quality. This also makes it lightweight, able to increase impact displacement, and very strong. In addition, the energy displacement is increased through the dual density EPS making it among the quietest options. The face shield is also impressive, as it features a high resistance, anti-fog material. This makes it remain clear even when you are riding in difficult positions, as the technology used is state of the art. The coating itself is also hard and resistant to scratches, with a UV-A and UV-B protection level. It is also easy to operate the visor, either by sliding it up or down. The liner is additionally removable, for those instances when you want to wash it, while its microbial fabric keeps you warm in cool weather and dry in warm weather. If you are searching for a starter helmet that comes at an affordable price, this is a great place to begin. The construction of this helmet is similar to the others as it involves lightweight polycarbonate, while the padded collar decreases the road and wind noise significantly. The interior lining is also removable and washable in case you need to do so. Also, note that the shield will come in a clear design, instead of a tinted shield. Something that makes it stand out is the click release, which you will not find in most motorbike helmets. This feature allows you to replace the shield quickly when you are on the move, while it also has a D-ring closure system on the chin strap (also featuring heavy padding for extra comfort). The cheek pads are also comfortable as they are contoured, while the shield is resistant to UV rays and anti-scratch. The good thing is that the helmet easily fits FMVSS 218 standards, so you are assured it is of high quality, in addition to its five-year warranty. If you are into the thrill of street riding yet want a helmet that guarantees some peace and quiet as you do it, then the 1Storm is a great place to start. the build is definitely of high quality, as it is DOT approved, and it comes in a large size to ensure you stay comfortable (especially if you do not have a small head). The visor has a dual lens design, and a quick release to engage it when you need to. In addition, the shell is a lightweight aerodynamic alloy, which means that it stays comfortably on your head without giving you the feeling of weighing you down. Since the alloy is resistant to UV rays, it is also durable and resistant to scratching. The padding is also removable, just like the other helmet linings on this list for those days you want to wash it without the struggle of washing the helmet itself. The front fails to lift to reveal the complete frontal. This has an interesting take on the quiet helmet aspect, as it gives you all the advantages of open helmets with the performance of a full-face helmet. The ABS shell has a strap that is micro metrically adjustable this makes it have a wide adjustment range. The good news is that it also meets the high DOT and FMVSS 218 standards, so you are assured you are purchasing something of high quality. The cheek pads and helmet liner are soft and lightweight, and they are all washable and removable. The design of the helmet itself is also great and reduces wind noise significantly. Its durability is not in question either – the design is anti-fog, anti-scratch and wide view. While all these helmets are impressive in terms of their design, our pick is the 1Storm helmet, as it is very comfortable while staying large and durable. It combines all the features you need in a quiet helmet, although the frontal is the only disappointing aspect.